With your own operation in mind, consider these management tactics – included are some pros and cons. Regularly incorporate soil amendments like composts into high tunnel soils. 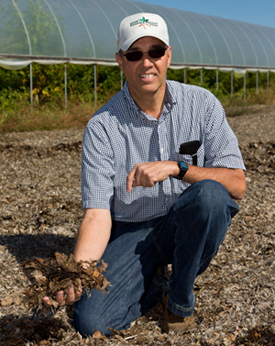 Using composts maintains fertility and soil quality plus avoids the need for cover crops with inconvenient fallow periods, but may be cost prohibitive. 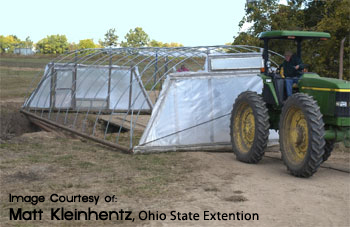 Move the high tunnels every few seasons to nearby or adjacent fields where cover crops and/or soil amendments (manures, composts, or un-composted municipal leaves) were aggressively used on fallowed soil. Due to existing tractor and implement sizes, it is frequently much easier to grow and incorporate cover crops and amendments in open fields, and periodically relocate tunnels. This is much more efficient than performing these rotation and soil fertility building practices inside the tunnels and losing production seasons to fallow periods.